The march arrives in Selma, Alabama on March 25, 1965. From left: Ralph Bunche, Rev. Martin Luther King, Jr., Coretta Scott King, Rev. Fred Shuttlesworth, Hosea Williams. Photo By Morton Broffman/Getty Images. On this date 50 years ago, Martin Luther King, Jr. stood on the steps of the Alabama State House in Montgomery and addressed a crowd of 25,000 who had assembled there at the conclusion of the storied Voting Rights March which began with the violent repression of Bloody Sunday, March 7, 1965. After being blocked by the forces of Governor George Wallace, the publicly televised, violent repression of the marchers on March 7 was transformed into a stunning victory eight days later when a movement had seized the energy of a nation and the attention of a President, and Lyndon Johnson declared a governmental commitment to securing voting rights for all Americans. Have we settled for a normalcy in which God’s work of racial justice still struggles to be born? How might we help it along? While I was walking with students from Dominican University on a Civil Rights immersion in the week following the #Selma50 Jubilee and President Obama’s rousing address, Anthony Hill, naked and unarmed, was shot miles away from where the students and I were staying in Atlanta. The perishing of black bodies remains all too normal in our world and this violence infiltrated a week meant to provide sustenance for activism and hope for my students’ vocational commitment to nonviolence and justice-making. Almost as if on cue, the Sigma Alpha Epsilon chant scandal broke out that same week and the role of higher education in addressing and combatting racism on and off-campus came into focus on our journey. Then the bloody arrest in Virginia of Martese Johnson, a Chicagoan like many of my students, further convinced us that everyone especially our students are in jeopardy of being both the targets of and the perpetrators of racially-motivated violence. Microaggressions, which have been the focus of so much of our discourse in higher education in the last few years, are only the surface sheen on that great iceberg of unexamined bias and racism that conceals in the still depths of King’s “ocean of material prosperity” a terrible violence that is being unleashed on our students, neighbors and friends, and on our very selves. All of us must ask ourselves which normalcy we would choose – the normalcy of justice, right relationship and agapic love or the normalcy of complacency that keeps interlocking, systemic oppression in place. This is no false dichotomy. I believe that particularly within the Catholic community, the historical legacy of our praxis of faith in higher education—incarnated in our theology departments and campus ministry units—stands in the stream of complacency unless we make conscious, explicit, and frequent decisions to engage our students and each other and invite discourse and action about justice, particularly and clearly on the issue of race in the United States. So I write this to my peers in Catholic campus ministry. I write this to my friends who are theologians and scholars. I write this to my colleagues of every Christian denomination. The signs of the times cannot clamor more loudly. Reflect on your curriculums, your programs, and your praxis and ask yourselves the following: Where am I teaching anti-racism? Where am I inviting new forms of praxis that ground themselves in the historically marginalized spaces of underrepresented groups? Where am I inviting the story of long suffering peoples to be narrated and explored in my syllabus, in my immediate practice, and in my department’s programming? And most importantly, how am I doing that in a way that empowers and emboldens my students to make such work a vocation no matter their career trajectory? These are just a few questions that have roiled me in the wake of my own experiences with students at and following the 50th Anniversary of the Voting Rights March in Selma. While there is not space here for the dissertation that can be written on the historical roots and ministerial implications of this egregious blind spot in our praxis, I would hope that my colleagues reading this would be invited into a sort of examination of conscience and evaluate the truth of such a broad and risky claim from the vantage point of their own experience. Like me, perhaps you were the product of a series of engagements with service, liturgy, and faith formation. Did you discuss race and racism in your experiences through Catholic campus ministry? Did you do so across difference in a community of diversity or, instead, was your experience marked by deep conversations about the differences between you and those you were “serving” on an immersion trip? Did theological reflection invite you to consider your own complicity or victimization in power structures? How deeply did those experiences disrupt the notions of race and privilege into which you were socialized no matter your background? 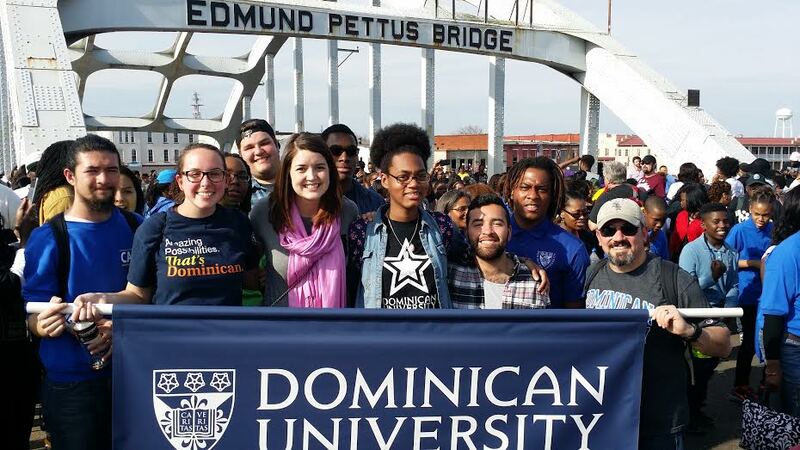 Students from Dominican University participate in the 50th anniversary of the march in Selma, Alabama. The idea and experience that sparked this piece for Daily Theology is an alternative break immersion that I just completed with ten students, which we named “March: a Civil Rights Journey at 50.” March was an experience that created a critical dialogue between the history of the Civil Rights movement in Selma, Montgomery, Atlanta, Birmingham, and Memphis and the students’ commitments to social action in the here and now. It is not an original idea, though the thematic strands that we explored were the choices of Gil Cook, Assistant Professor of English at Dominican University and me. We borrowed the template for the experience from Heath Carter, Assistant Professor of History at Valparaiso University, who led a group of more than 50 to the South. We had talked about the possibility of a trip like this since we had taken high school students to the School of the Americas protest in the fall of 2005. Heath was mentored by Professor Alan Bloom, who died suddenly just over a year ago. The genealogy is important. The immersion’s origin story is sharing that models the Gospel or the post-Resurrection community in Luke-Acts. It stands as a testament to a passion to extend the classroom and, indeed, the ministry center, beyond the four walls of the University. It demonstrates that friendship (Heath and Alan’s, and Heath and mine, and Gil and mine) and justice can carry you (and your students) to important places. The transforming power of relationships like these motivates and sustains us. Christian higher education is all the better when these collaborations invite the intersection of our disciplines and our passions. As ministers and theologians, we all need to learn a lesson from the Movement and not be afraid to be organizers of the march together. The lesson here is that creative collaborations and growing relationship even and especially those outside of our charism networks (AJCU, ACCU) embodies some of the best qualities of successful social justice movements. The immersion is a creative space and a liminal space that is primarily for accompaniment. As ministers or teachers that shape such experiences, we become what critical pedagogue Henry Giroux calls “cultural workers” who learn alongside the students. The March itinerary was built around questions that I wanted to work through – principle among them: What does it take to stand against relentless oppression? The immersion created a liminal space where our team could bear witness to the struggle for public life then and now. Sitting at the feet of the footsoldiers, leaders, and icons of fifty years past was part of the story. The throng on that first weekend in Selma – an estimated 50,000 on Saturday and 90,000 on Sunday to cross the Edmund Pettus Bridge – was another equally important part. Whether it was the recognizable faces of the movement like John Lewis and Diane Nash or the faces of thousands of African-Americans walking together in the stream of history, my students and I received the gifts of passion and strength. What happened those days in Selma and afterward was what Shawn Copeland calls “Eucharistic solidarity…[and b]ecause that solidarity enfolds us, rather than dismiss “others,” we act in love; rather than refuse “others,” we respond in acts of self-sacrifice—committing ourselves to the long labor of creation, to the enfleshment of freedom.”[vi] The long labor of creation and the enfleshment of freedom came in all sorts of encounters. I am graciously able to share the next two with you through the permission of members of our team. In Atlanta a few days after we left Selma, we toured the National Center for Civil and Human Rights. One section has a simulation of the lunch counter sit-ins that famously took place in Nashville, TN and in other cities throughout the South and were largely the work of student activism and organizing. The exhibit invites the onlooker to sit on a stool at a replica counter and a put on noise-cancelling headphones. It then runs through a progressively violent and jarring simulation of the abuse that nonviolent protestors endured. Without immersing you all in every detail, I will share that every one of us had very emotional reactions to the exhibit. When I finished, I realized that one of the students who was seated next to me was having a hard time. She sat weeping, her head in her arms on the counter. The full weight of sacrifice and history and identity came crashing in at once. She is African-American. I placed a hand on her shoulder and she continued to cry. A middle-aged African-American woman approached with a box of tissues. She worked at the exhibit. She gently leaned over and turned the stool with one hand. With one swift motion, she handed the student the tissues and enveloped her in a long embrace. She said, “Honey, it took me three weeks to sit down there, and then it took me three days to recover. They did it for us. You cry as much as you need to.” More appropriate words could not have been spoken this Lent and on this trip – they did it for us. A day later, we were invited to participate in some of the choral singing that takes place in the afterschool enrichment program at the Global Village Project, a school for refugee girls. We will never forget being invited (all eleven of us) to sit on the floor in the middle of ring of refugee women holding hands as they sang a choral piece that they had been rehearsing for a few weeks. There. In the center of the margin, we found solidarity that truly enfolded us in the rhythmic harmony of the voices of the world, the many voices of God. They were brought together in a kairos moment just like that March across the bridge though intensely less public. The lesson here is two-fold. First, we cannot imagine new futures for ourselves if we are not open to the possibility of receiving acts of self-sacrifice. Second, Eucharistic solidarity can only come through relationship with and accompaniment by those who have been oppressed and that IS the work of the immersion itself. John DeCostanza, Jr. is Director of University Ministry at Dominican University in River Forest, IL, and a DMin. candidate and Joseph Cardinal Bernardin Scholar at Catholic Theological Union. [i] Martin Luther King, Jr.. “Address at the Conclusion of the Selma to Montgomery March**.” Address at the Conclusion of the Selma to Montgomery March. March 25, 1965. Accessed March 19, 2015. http://mlk-kpp01.stanford.edu/index.php/encyclopedia/documentsentry/doc_address_at_the_conclusion_of_selma_march/. [ii] For a more detailed description of the ways that “the silence of white theologians bespeaks the contradiction between our claims for a universal, ontological human equality and the reality of the social, political, and economic privilege white theologians and ethicists consciously and unconsciously accept and assume,” please see the introduction (from which the preceding quote is taken) and the essays included in Laurie M. Cassidy and Alex Mikulich, eds. Interrupting White Privilege: Catholic Theologians Break the Silence. Maryknoll, NY: Orbis Books, 2007. [iii] James H. Cone. God of the Oppressed. Rev. ed. Maryknoll, N.Y.: Orbis Books, 1997. 139-144. [iv] Henry A. Giroux. Border Crossings: Cultural Workers and the Politics of Education. New York: Routledge, 1992. 135. [v] M. Shawn Copeland. Enfleshing Freedom: Body, Race, and Being. Minneapolis: Fortress Press, 2010. John, I finally got around to reading this (candidacy exams and all), and it’s really a fine piece. I wanted to thank you for it, and ask a question that you may or may not have an answer to: while I completely support the profundity of experiential trips like you are describing (and hope to do some of my own with students one day), is there, or can there be, a Catholic theology for protest? A theology of protest, perhaps, that tries to weave together the struggles of daily life with the profound struggles of living within a systematically unjust system? On the one hand, I see that a theology “of protest” is present implicitly in many voices and authors, and explicitly in the words and actions of people who protest in Christ’s name around the world. But as I peruse the academic theological landscape, I find myself coming up with little currently available explicitly on this increasingly important topic–how do we protest, and what do these actions mean in the eyes of God and the church? Do you know of any theological resources, reflections, or books that address this topic? Thank you again for writing. It was a beautiful piece, clearly based from a powerful experience. John, I really appreciate your thoughtful response and the incisive questions. I like the idea of a theology of protest. In my own thinking, I have been naming this a theology of resistance. I think the two might be the same thing, but that might require us having some additional conversations over coffee to hash that out. I agree that protest/resistance is implicit in much of the work that is currently being done in the US by Catholic theologians from underrepresented groups within the academy itself- Latin@s, African-Americans, women, etc. I think/hope some white males like me are trying hard to live into our identity as allies and more earnestly considering, writing about, and challenging the privilege from which we benefit. I think this begins from the particularity of experience like all good liberative method. I think much of academic theology doesn’t necessarily begin there. The questions you raise – how do we protest, and what do these actions mean in the eyes of God and the church? – these questions presuppose injustice in the concrete world of a particular people or community as a starting place for theologizing (we have to have something to protest). I actually think the best examples of this kind of writing are theological or spiritual memoirs or praxis manuals that are not meant to be theology as such – Dan Berrigan Dorothy Day, Dean Brackley’s The Call to Discernment in Troubled Times, or even Bonhoeffer’s Life Together or The Call to Discipleship (when you really consider their context). The other part that is key for me is that this kind of thinking be pastorally engaged. I am so immersed in US Latin@ theology (my concentration at CTU is in Hispanic Theology and Ministry) and there is no separation between academic theology and pastoral ministry. To do one is to do the other and vice versa. I really believe that my peers and I need to be more engaged in helping to craft a theology of resistance that offers our students or parishioners a theological ground for engaging in this kind of work not just an experience that plays with human affections. John, this is a great question! Thank you so much. I appreciate being able to do the thinking alongside of you. I hope that others will enter into the conversation as well. Thank you for this blog. I agree that we must break the silence and complicity in our pulpits and in our teaching. I wonder if one aspect of reconciliation and restoration isn’t also about encouraging everyone to share their story, not just those whose voices were at the heart and heat of the struggle. This week marks the 50th anniversary of my parent’s wedding in Selma. It took nearly 40 years for my mother to share with me that she was there. Today I broke the silence with my blog in http://www.everydaylifeeverydayfaith.com . Blessings.